We have dedicated ourselves to the advancement youth in golf. 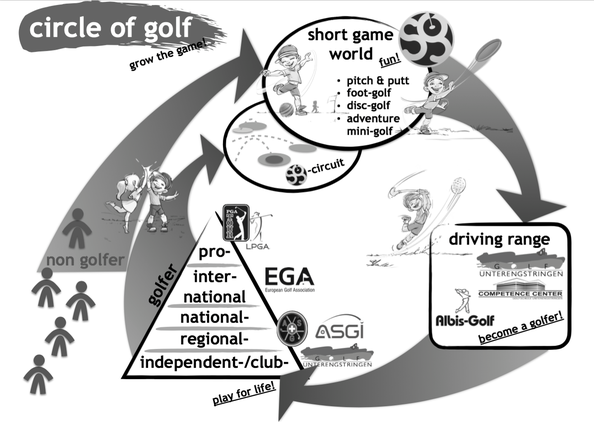 In addition to our development programs for children and young adults in golf, we are also interested in advancing golf in Switzerland by introducing adults who have not yet had the chance to learn to this sport in a fun and relaxed way. For this, foot golf and disc golf are excellent trends that everyone can try and have fun without needing at the first try special skills. It is very important for us is that families have a fun, leisure time together. However, it is also very important for us that the experienced golfer can train their short game in a exciting and challenging atmosphere. On a 18 Hole golf course, 60% - 80% of all swings are under 90 meters. The short game is important for every golfer to train and improve!